In 2010, scientists led by J. Craig Venter became the first to successfully create 'synthetic life'-putting humankind at the threshold of the most important and exciting phase of biological research, one that will enable us to actually write the genetic code for designing new species to help us adapt and evolve for long-term survival. The science of synthetic genomics will have a profound impact on human existence, including chemical and energy generation, health, clean water and food production, environmental control, and possibly even our evolution. 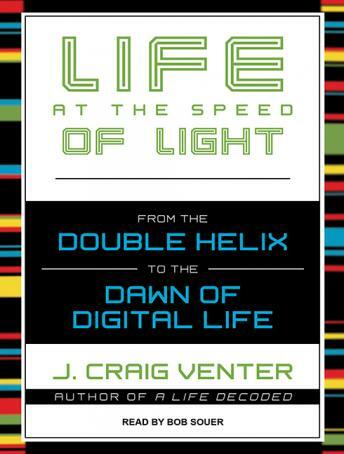 In Life at the Speed of Light, Venter presents a fascinating and authoritative study of this emerging field from the inside-detailing its origins, current challenges and controversies, and projected effects on our lives. This scientific frontier provides an opportunity to ponder anew the age-old question 'What is life?' and examine what we really mean by 'playing God.' Life at the Speed of Light is a landmark work, written by a visionary at the dawn of a new era of biological engineering.